Riders of the KTM 1190 Adventure tend to push their limits on this insanely fast and suspension-latent adventure bike. When the bike inevitably goes down one of the most vulnerable areas on this beast is the engine case. The AltRider Clutch Side Engine Case Cover is meant for riders who refuse to take a gamble on their machine. 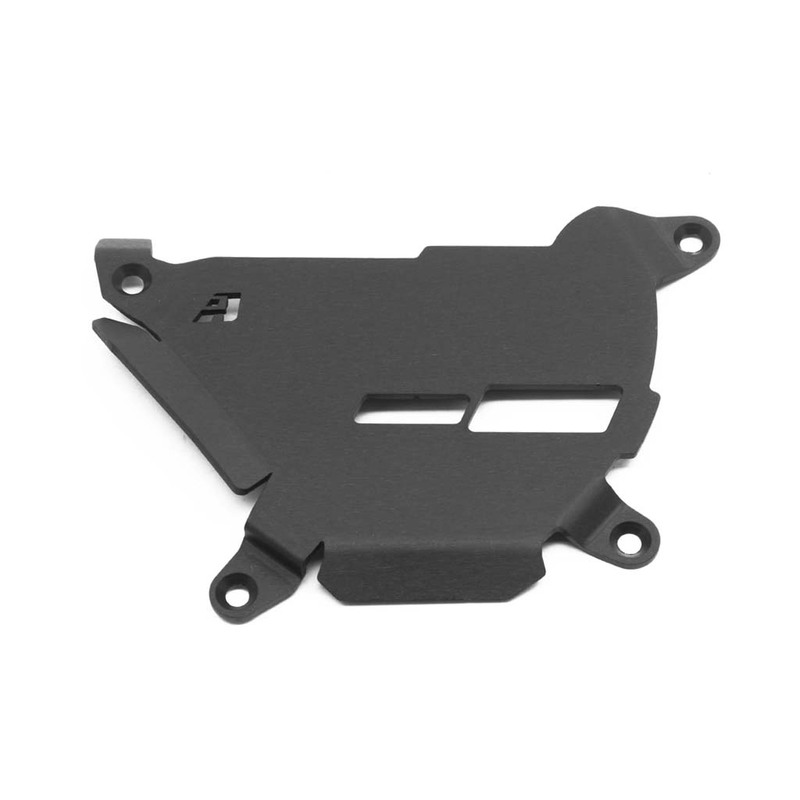 The OEM engine case on the 1190 is made from a thin-walled cast aluminum. This choice helps to save overall weight but also creates a weak point on a vital piece of the engine. If you lay the KTM 1190 down on its right side there is a real danger of the engine case becoming damaged by large debris or even from the brake lever tip bending into it potentially bursting into the case. Compared to several competitor options made from molded plastic we created an engine case cover made from a single piece of 3.2 mm aluminum. This exceptionally strong 6061-TG6 aluminum alloy has a tensile strength of at least 42 000 psi (300 MPa) and yield strength of at least 35 000 psi 241 MPa. Rubber backers spread the load of impact as well as allow the cover to maintain a low profile. Flush stainless steel fasteners and a deburred product prevent scuffing up your boots and pants. The design of the case cover also incorporates the ingenuity of the AltRider Brake Lever Shield preventing unwanted and unexpected early braking. The close design of the OEM brake lever creates early interference with the riders boot during braking. This is unique to the KTM 1190 as KTM worked hard to make the large displacement engine still feel narrow which in turn provided little options for routing the rear brake lever. The lever arm extends into the rider boot area above the brake tip thus creating earlier-than-expected braking. An outward flange on the AltRider Engine Case Cover prevents accidental engagement of the brake arm while still providing a surface to properly hug the bike with your boot all without interrupting any feel or ergonomics.